February 14 is upon us and it can be a tricky occasion in terms of finding the right Valentine’s Day gift for your romantic partner. Do you go traditional, with chocolates, flowers or maybe a nice dinner? Or do you get your partner something that they will enjoy long after February 14 is over? While the more traditional presents are always nice, certain people on your Valentine’s Day gift list might appreciate something more practical to show your affection and love. Here’s a look at some of the best Valentine’s Day gifts you can get for techies (or maybe you can suggest these gifts to your Valentine to give to you on Thursday?). The OnePlus 6T is still one of the best smartphones you can buy. OnePlus is sadly not offering a red version of the OnePlus 6T for Valentine’s Day, as it did for the OnePlus 5T in 2018. This time around, the company is selling the 6T at a discount in a special bundle offer for folks who want to splurge for their techie partner. The bundle includes a OnePlus 6T, a pair of OnePlus Bullets Wireless headphones, and a bumper case for the phone. You will save $20 on the bundle compared to buying each item separately. It’s basically a “win-win” for you and your techie Valentine. Sadly, this bundle deal does not include the special McLaren Edition of the OnePlus 6T, but if you really want to show your love and affection for your techie partner on Thursday, you should consider getting this version of the phone. It has 10GB of RAM, 256GB of onboard storage, a special charger that offers a day’s worth of battery use in just 20 minutes, and a sleek black carbon fiber design with an orange trim around the phone. That’s all for the higher, but still reasonable, price of $699. If your Valentine’s Day gift recipient loves to stream movies and TV on their smartphone or their older 1080p TV, but wants something bigger for their living room, you can’t go wrong with this big 65-inch 4K TV from TCL. It not only has great picture quality, thanks to its Dolby Vision high dynamic range (HDR) support, but it has the Roku operating system installed. It’s probably the best smart TV OS there is, with access to nearly all of the major free and premium movie and TV services. It’s available now on Amazon for $999.99. Google’s Pixel Slate is one of the few Chrome OS tablets that’s currently on the market, but not only can it run Android apps, this 12.3-inch device is actually better than nearly any Android tablet currently on the market. It’s also not too heavy at 1.6 pounds, and the design, with its curved sides and rounded corners, makes it look pretty slick for a great Valentine’s Day gift. Best Buy is currently selling the Pixel Slate starting at $799 with 64GB of storage. You might also want to pick up the optional, and detachable, Pixel Slate Keyboard for the tablet, which will cost an extra $199. Valentine’s Day can not only be a great gift giving occasion for your partner or dear friend, it can also help them stay healthy so you can enjoy their company for a long time. The folks at Fitbit are currently offering special Valentine’s Day discounts on three of their fitness wearables and smartwatches. The Fitbit Versa currently has a $30 discount for its standard edition, reducing its cost to $17o, while the special edition costs $200 with this promotion. The previous smartwatch from Fitbit, the Iconic, has a $40 discount for Valentine’s Day. Finally, the company’s newest fitness wearable, the Fitbit Charge 3, is being sold for $20 off its normal prices. That means the standard edition costs just $130, while the special edition, which includes Fitbit Pay support, currently costs $150. In addition, if you buy these wearables from Fitbit’s website, you can get free two-day shipping for all orders over $50 if you put in the promo code CUPID at checkout. The Google Home Hub is, quite simply, the best smart display on the market. It’s also a great Valentine’s Day gift idea for anyone who wants to enter the smart home, or just the smart speaker trend. The 7-inch, 1,024 x 600 resolution display, combined with what is basically a Google Home speaker with support for Google Assistant, will allow your Valentine to do things like order flowers with just their voice or learn how to make that perfect romantic dinner for two with access to YouTube. At $149, it’s not the cheapest smart display or smart speaker on the market, but your partner won’t be disappointed with the Google Home Hub. In addition, Google is holding a special Valentine’s Day hardware sales event where you can save on Pixel phones, Nest Thermostats, Nest Cams, and much more. If your Valentine has an older television that doesn’t have smart TV support, or if its included smart TV apps are not to your liking, then you simply have to get them a Roku Ultra set-top box. It supports up to 4K video, and like the TCL TV, the Roku OS allows you to get nearly every major streaming video service. It also comes with its own set of earphones, in case your Valentine watches TV at night and doesn’t want to disturb you. It’s perfect for your “Netflix and chill” evenings, and it’s currently available on Amazon for just $85. As we stated, smart speakers and hubs are becoming more popular, and if your Valentine wants to check out a smart device without a screen, the Amazon Echo is the best one. It will allow your Valentine to use the Alexa digital assistant to order flowers, learn what the best romantic poems are, and much more. Amazon is currently selling the standard Echo for just $69.99 for the Valentine’s Day period, a $30 discount from its normal $99.99 price tag. In addition, Amazon is holding its own hardware sale event for Valentine’s Day, with big discounts on products like the Echo Plus, Echo Show, Kindle Paperwhite, and much more. The third generation version of the Amazon Echo Dot is perfect for the Valentine’s Day gift giver who wants to offer something nice for their tech-obsessed partner, but doesn’t have a lot of cash. The Echo Dot’s audio quality is much improved compared to the first and second generation models, and it still offers hands-free commands to play some romantic music or you can pair it with a smart hub so you can ask it to dim the house lights if you like. The Amazon Echo Dot is available now for $49.99. For your Valentine who loves classic video games, show them you love them by picking up this tiny game arcade cabinet. Yes, they can have the miniature experience of playing classic video games in a classic 1980’s arcade, but without using any coins. Each of these cabinets costs between $13.85 and $18.59 on Amazon, and you have your choice of Pac-Man, Ms. Pac-Man, Space Invaders, Galaga, Galaxian, Frogger, or Dig Dug. This next deal is for those folks who just want a more traditional Valentine’s Day offering. Bouqs has a special promotion that will allow you to send a gorgeous bouquet of flowers to your loved one. 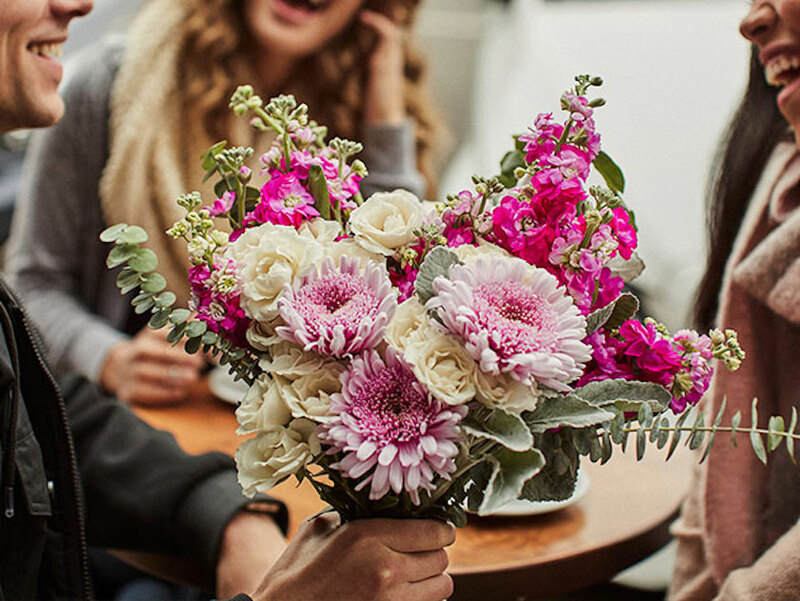 This deal would normally cost $50, but our special offer cuts that price down by 40 percent, so you can send them a flower arrangement for just $30. Best of all, you can send these flowers to your sweetie in as little as two hours. If you want to save some money this Valentine’s Day, you can send ebooks and audiobooks from Google Play as gifts to your significant other. For the holiday, there are some discounts available on romance novels, such as The Bet and Only with You for $1.99 each, and Ttyl for $2.99. If your Valentine is a Star Trek fan, you can also get them several novels in the Star Trek: New Frontier series of ebooks for 99 cents each. What other tech-related gifts would you want to give or receive this Valentine’s Day? Let us know in the comments!